4 Ex-Fraternity Members Sentenced In Pledge's Hazing Death : The Two-Way Four men from New York City were sentenced to jail time Monday in the 2013 hazing death of a Baruch College freshman during a fraternity trip to the Pocono Mountains in Pennsylvania. 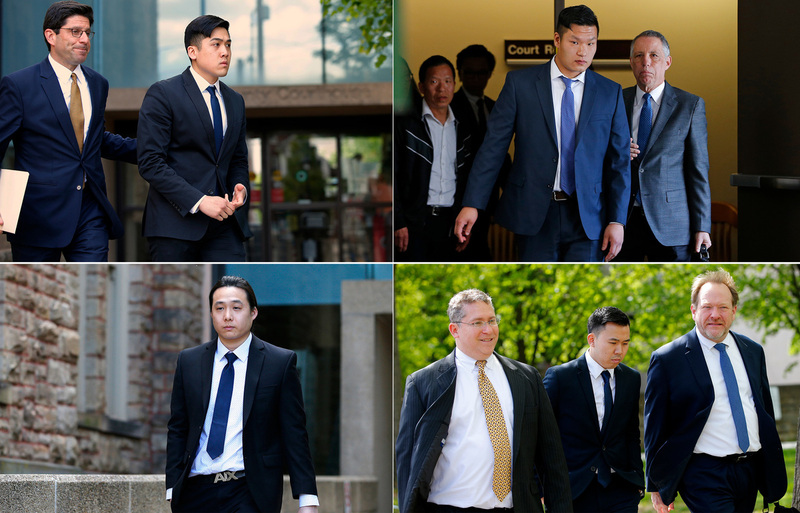 Sheldon Wong (clockwise from top left), Raymond Lam, Kenny Kwan and Charles Lai leave the Monroe County Courthouse in Stroudsburg, Pa., in May 2017. Four former fraternity members were sentenced to jail time Monday in the 2013 hazing death of Chun Deng, a freshman at Baruch College in Manhattan. Deng went to the Pocono Mountains in Pennsylvania to finish pledging Pi Delta Psi, an Asian-American cultural fraternity. During the process, he was blindfolded, forced to wear a backpack weighted down with sand and then repeatedly tackled. He was knocked unconscious and later died at a hospital. During the investigation, police charged 37 people with crimes ranging from aggravated assault and hazing to third-degree murder. "'Not one person out of 37 picked up a telephone and called an ambulance. I cannot wrap my head around it," Monroe County President Judge Margherita Patti-Worthington said. "So there's something greater going on here, and I think it's probably really prevalent. We see across the country these issues in fraternities.'" The four defendants, all from New York City, were sentenced after pleading guilty to voluntary manslaughter, hindering apprehension and other charges. They had been initially charged with third-degree murder. Kenny Kwan received 12 to 24 months in county jail. Raymond Lam and Sheldon Wong were given 10 to 24 months each. And Charles Lai was sentenced to time served; he had spent 342 days in jail because he could not make bail. Prosecutors described the sentencing as "disappointing" — they had wanted the defendants to receive more time. "Mike is my only son and only child, and the truth that he is gone can't be erased or wiped away no matter how hard I try," Mr. Deng's mother, Mary Deng, said in a statement. "I feel like I have no big words to explain this. How can somebody treat another person's life like this? Like it's a joke? My husband and I spent 18 years raising Michael to be a good person, a good son. And in a single night, all those years are suddenly gone." Patti-Worthington also banned the fraternity from operating in Pennsylvania for 10 years and ordered the fraternity to pay a fine of $110,000 for its role in Deng's death. The fraternity was banned from Baruch College after the hazing incident. It also had chapters at Carnegie Mellon University and Penn State. While issuing her ruling, the Times reports, the judge also noted the recent hazing death at Penn State. In that February 2017 case, 19-year-old fraternity pledge Timothy Piazza was served at least 18 drinks in 82 minutes, then drunkenly fell headfirst down a flight of stairs. He first fell at 11 p.m. and became unconscious. He awoke, appearing to be in pain and fell again at 5 a.m., but an ambulance wasn't called until after 10:45 a.m. In September, the most serious charges in that case were dismissed by a judge, who ruled that misdemeanor charges were more appropriate. A previous version of this story misspelled Timothy Piazza's last name as Piazzaz.